If you're one of the lucky few grads who have a job or clients waiting for you after graduation, you probably won't need this post. But if you're a student who's graduating without work lined up, you're heading into a tricky period that sometimes claims the careers of young artists before they ever get started. 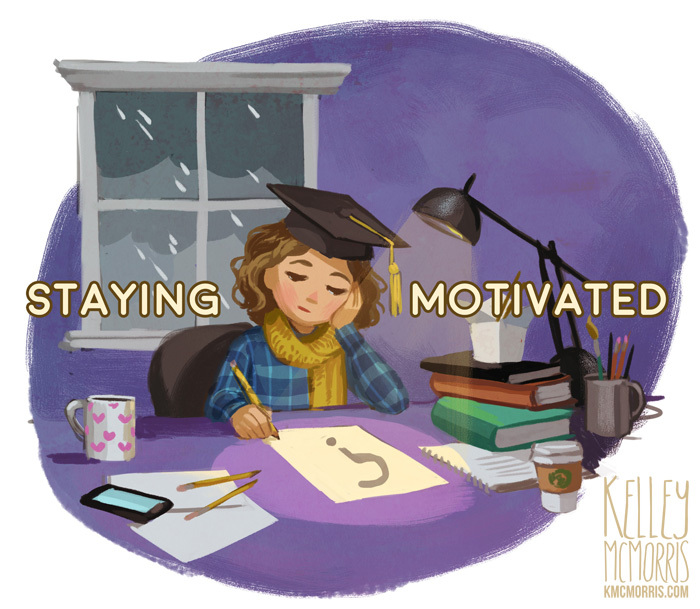 After graduating, you will probably feel a slump in motivation and direction. I felt this myself after graduating, and I've heard it from other grads too. After all, finals are exhausting! It's ok to take a short vacation. Give yourself permission to not draw for a week without feeling guilty. However, it is vital that you take steps to snap yourself out of this slump, and quickly. Otherwise your "vacation" will just extend for weeks or months, and it will be that harder to regain your momentum. When this happens to people, they stop producing, begin to lose their connection with the art world, feel guilty for not drawing, avoid thinking about drawing because it makes them feel guilty, feel inferior to peers who are getting work or winning awards and the whole situation becomes a katamari of despair. This is when some people give up. 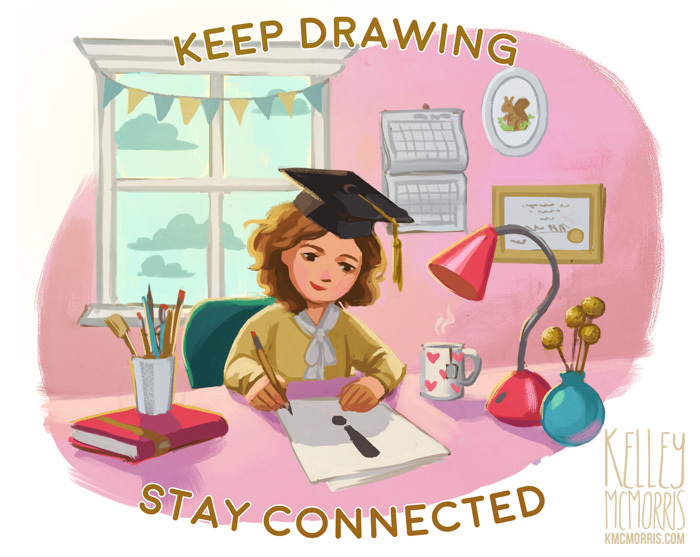 The way to avoid this post-grad slump is to keep drawing and stay connected. Don't get rolled up into the despair katamari! It will not turn you into a star! Set up your studio. If you're like me, your "studio" is just a laptop on a desk - a far cry from the eye candy on your "Dream Studio" Pinterest board. Still, do what you can to make it a place you want to be. Clean it, declutter it, recycle homework assignments. sell those textbooks. And, most importantly, put some artwork on the walls! This is now the studio of a professional, not a student. Draw what you want to draw. Rejoice - after years of drawing whatever your teachers told you to, you get to draw whatever you want! Go nuts! If you don't know what you want to draw, start with what you liked drawing as a kid. Keep drawing whatever feels good and makes you happy. Give yourself a personal project with definite goals and a deadline. Take those drawings you enjoy doing and shape them into a project for your portfolio. For example, try creating concepts for five characters, environments, and weapons. Or make a children's book dummy, design a deck of playing cards, or start a web comic with weekly updates. Listen to illustration podcasts. Listening to people talk about drawing while you're drawing is surprisingly motivating. Here's a list of illustration-themed podcasts, and here are some illustrator YouTubers you can watch. Post your artwork online. Whether you're trying to build up an online fanbase or get noticed by employers, posting your artwork online is essential. In addition to your portfolio website, you have to post on social media sites where people can easily find you and share your work with others. CGHub, Deviantart, Instagram and Tumblr are popular places to start. Don't wait until your art is "good enough." Just do it! Enter group shows, collaborative zines/anthologies and contests. A great way to find these are by following illustrators on Twitter and Tumblr. Light Grey Art Lab posts regular calls for art for their shows. Enter contests on Deviantart. Having a deadline and being part of a project with other artists will develop connections and keep you from feeling isolated. If you can't find a collaborative project to be a part of, considering starting one with some friends. Attend conferences - as many as you can reasonably afford. In my experience, nothing has as much inspiration and mood-boosting power as a conference. Having that event on the calendar gives you something to look forward to. There are hundreds of conferences to choose from in the US - so ask friends with similar artwork which conferences have been most beneficial for them. If possible, keep your costs down by attending a local conference. Look into having artist alley tables at conferences or art fairs. This isn't everybody's idea of fun, but seeing people respond to your artwork in person can be really encouraging. Signing up for a table gives you a reason and a deadline to create new work. Start small - you will probably not make a profit on your first few shows. Consider them practice runs. To cut back costs, attend a local show and split a table with a friend, or start out as a table assistant for another artist. As illustrator Howard Lyon put it, "nothing chases away fears like working hard." Also reaching out to artists that you admire and telling them you like their work can also sometimes spark a conversation which then sparks your motivation! Great post Kelley! I've fallen into this slump two years after graduating 😖 after working a full-time job straight out of school that was only semi-art related, my art and portfolio inevitably has fallen to the wayside. I quit that job two weeks ago (long overdue) and have been really struggling with the guilt that you described since then while trying to revive my art. These tips are great and inspiring, thank you! I'm so glad you found this inspiring. The guilt is real, but the only way to get through it is to keep drawing. You can do it!